Product prices and availability are accurate as of 2019-04-15 04:06:16 EDT and are subject to change. Any price and availability information displayed on http://www.amazon.com/ at the time of purchase will apply to the purchase of this product. 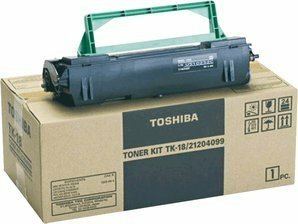 Toner Cartridge for Toshiba Models DP80F, 85F Plain Paper Fax Machine, Black Delivers outstanding quality and reliable printing every time. Designed with an advanced toner formulation to produce sharp text, smooth grayscales, and deep blacks.